The sun is peeking out from behind the clouds right now. It reached nearly 56 today. It felt like a heat wave…well because it kind of was. After having snow on the ground since mid October with only small moments of warmer days we have had one good winter. It has been healing and amazing to just go through a winter without much time away from here. There were tough moments and ones where I about pulled my hair out and there hit a point where I felt ready for these muddier days to arrive, but I couldn’t be more thankful for such a great winter of extremely beautiful cold days. We spent many nights in by the fire, drinking tea, reading books, and letting the slower days be the norm. We have done some deep work and learned new things. We have healed our bodies and eaten more soup then i thought imaginable. This winter I learned to truly feel winter in a new way. From the long walks in the quiet woods to the deep warmth of friends around a table that counter the negative temps out our doors. It has been a season of slowing and embracing and most importantly calmly living. 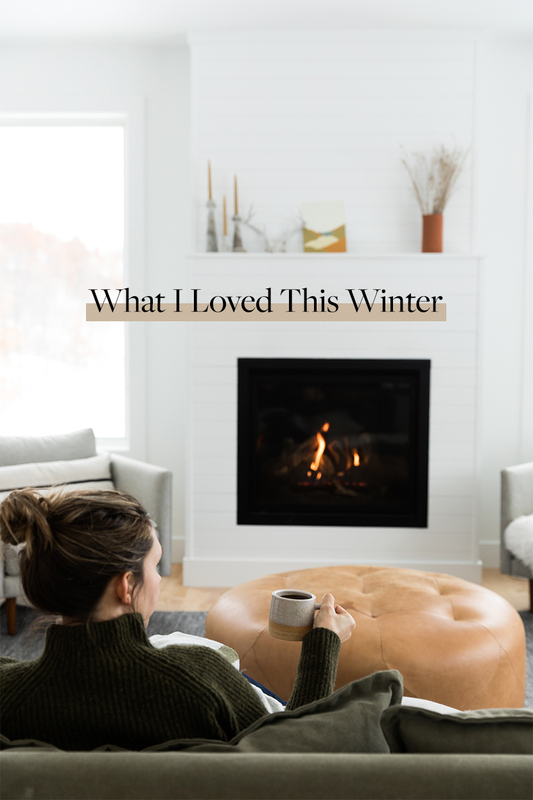 I am both excited and sad to let go of these days, but while I was starting to think about new routines, I thought about the things that really made for one amazing winter. I know it is the end of the season, but I still think it is important to know what helped us make the most of a season especially one that can feel like a challenge to overcome at times. So, I decided to gather these things up and let you know what made winter really lovely and one I am sad to let go a little bit. Though I am sure we still have a storm or two brewing out there before we are really in the clear in the northern woods. This list will give you a few extra things to enjoy till spring fully reveals herself. Since we usually get snowed in this is pretty awesome! We love both Populace Coffee and One Village Coffee. You can set your deliveries on subscriptions that fit your lifestyle and how much you drink and then they show up the same time every month. This helped us not to run out other than one time during the Polar Vortex, but that left us homebound for nearly a week. Cold toes in the winter is the worst thing in the world. Thus, I love these Bison Wool Socks from United by Blue. Wonderful and super comfy too. People ask me constantly about winter skin care. Here’s my trick…this balm from Badger. It is amazing and I slather my face, neck and any other dry places with it. Super natural and clean the ingredient list is basically edible so you know it is good. Two winters in and this stuff makes my skin never even notice it is dry and colder then ever outside. Oh and also drink tons of water too! I fell in love with Stegmann’s this winter. They are so warm. I love the hard sole and though they are intended for more than house shoes, I have only been able to wear them indoors all winter and I am okay with that. They are so comfy and warm. Cannot recommend them anymore. When the snow wouldn’t stop and we got stuck at home with endless snow days I lived for the sound of jazz. It kept me centered and calm during the days with a toddler and I really fell in love with the slow motion of it. Miles Davis is so good and this album is for sure one of my favorites. 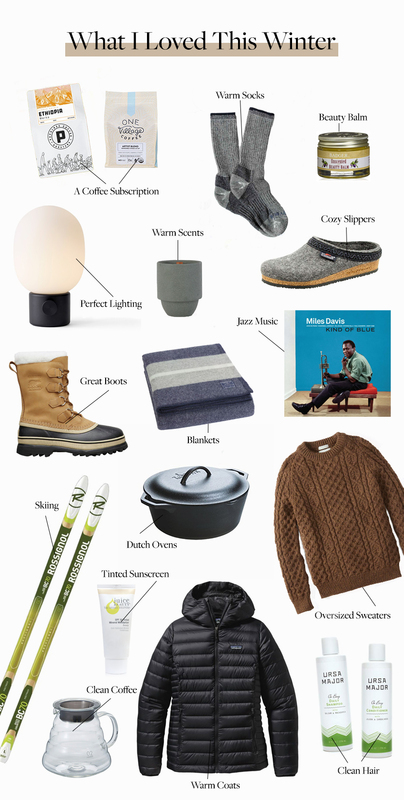 I love burning candles in the winter more than the summer and I love this collection of them that Huckberry carries. Plus the containers can be used for planters come spring! With the short days it is extra important to keep the lighting right. We have this light in our bedroom and my gosh it was my favorite thing this winter and made our bedroom so cozy in the evenings when reading books and drinking tea. Once again about those cold toes…Having great boots is great. These ones from Sorel are very heavy, but they don’t bother me because they warm as can be and I can think of only two days all winter (during the vortex) my toes were cold. I also have had these for almost 10 years and they still look great. I wear the laces super loose unless trekking through high snow and I can slip them on and off easily as well. Just be prepared they are heavy. Keep warm blankets everywhere. We have a few in every room to keep us warm during the coldest days of the year. I love everyone feeling cozy though our toddler has no interest in it…I do! I love a blanket in the mornings and evenings and wool ones are wonderful. Many people don’t ski, but literally the thing I will miss the most other than slow days is skiing. I love gliding through the freshest powder and feeling the silence of the woods while I forge new tracks in the snow. It will be missed so much because it feels so good to glide. I find cross country skiing more fun then running or any other sort of cardio workout so I will miss it no doubt. If you don’t want to ski though Snow shoes are fun too and help you stay over the snow when it gets deep. I hiked this way on icy days and it was super fun too! A necessity for the kitchen but even more so for winter. They will cook your bread, soup, braise a roast…you name it. We love our’s from Lodge and we have another larger one from Barebones Living as well. Both are beautiful and work great. Yes you still need sunscreen in the winter. Especially on the sunny days. I wear this one almost every day from Juice Beauty and I love how clean it feels on my skin. It moisturizes and acts as all the makeup other then mascara I need for the day. I love how simple it is. On really sunny and bright days I wear more then just this but for the most part most days I can use this. There is nothing better than a really nice fruity and flavorful cup of coffee to start the day. I love love love our V60 setup and couldn’t be happier with the cup it makes us every morning. I have about 3 different type of coats. One I pack away by April and then this Patagonia and my Patagonia shell stay out nearly year around. This one is the Down Sweater and I will tell you this thing unless you are in a really wet rainy snow is extremely warm and worth the hype. I only pulled out my Down Parka from Canada Goose about half of the winter because this one did the trick in many situations. If you live somewhere it is cold even a month out of the year it is necessary to have a coat like this one in your closet. It is chic and sporty but warm as can be. It won’t make you look bulky either! I love a great hot shower after a day I have been super cold. I don’t wash my hair a ton in the winter. Only about 2-3 times a week but when I do I want to do it right so I recently started using Ursa Major’s new Shampoo and Conditioner and couldn’t be happier with it. I love the scent and my hair is clean but doesn’t feel stripped or without it’s natural oils left intact. I second the warm shower after a cold day. Sometimes, it’s the only way to get the cold out of your bones! We had a long winter (by St. Louis standards) without many breaks, too, and I’m so renewed by the little green things fighting their way out of the soil and onto the tree limbs. I live for spring and fall, and the brief episodes of temperate weather we get!